In the 1870’s, Aldeburgh had a Pier north of the lifeboat station, probably near to the Moot Hall, but sadly it was not even half-complete before a Norwegian barque hit it causing considerable damage. The promoters suffered financially and the pier fell into disrepair, remaining a blot on the landscape for a further 25 years until it was eventually demolished. The design engineer was Thomas Cargill and the contractor was G. W. Hutchinson. The new pier was intended to be 567 feet long with seventeen equally spaced spans of 33 feet. Its width was 15 feet. At the head of the pier the platform would widen to an impressive 100 feet to provide a spacious area on which a handsome pavillion could be erected. 1864 Jul Aldborough Pier and Railway Bill authorising the construction of the pier was read a third time and passed by the House of Commons. 1871 Nov Proposal by Aldborough Pier and Railway Company to build two piers, a South Shelter Pier and a North Shelter Pier either side of a harbour cutting near Slaughden. 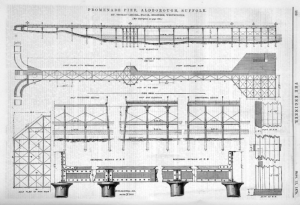 1878 Feb Petition to wind up the Aldeburgh Pier and Improvements Company Limited withdrawn by former engineer. 1881 Dec Partially completed pier and all construction plant and materials put up for auction. 1883 Feb Norwegian barque Lovely broke up and part hit Pier carrying away two end piles and girders etc., and knocking down two of the centre piles as well. 1883 Oct ‘Well-known local firm’ received orders to partially repair the damage done to the pier, but it is not clear whether such orders were carried out. 1886 Jun Tenders invited for pulling down the pier and the girders, brackets, piles and material. 1891 Samuel Wightman Smyth purchased the pier and Mr. James Richardson of Limehouse was contracted to remove the ironwork, leaving ‘a portion of the pier for further development’. 1909 Nov Pier finally demolished and auction held on beach for rusting ironwork and broken bricks. It is understood some of the foundations were dug up during the Second World War when defences were being built. The final two piles were removed when the sea wall was built.